LIBERAL, Kan. – One month ago, the No. 10 Seward County women’s basketball team set a school record for largest margin of victory over a Jayhawk opponent in school history. That record stood just 56 days before the Lady Saints broke it, against the same team, defeating the Colby Trojans by an 82-point margin, 130-48. In two games against the Trojans, Seward has won by an average of 80 points. Seward (25-3, 21-3) didn’t just break that record either. Choose nearly any team record and the Lady Saints broke it. Most points in a Jayhawk game? Check. Seward came only four points away from scoring the most points in school history. Most assists in a game? Check. Of the Lady Saints 49 baskets made, 40 of them came off assists. Most three-pointers in a game? Check. 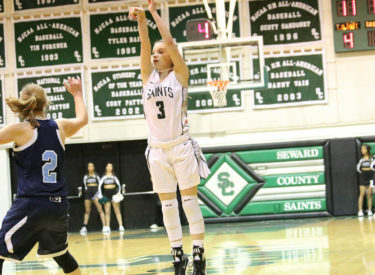 Seward County didn’t just break their own previous record of 19 made threes, the Lady Saints broke the NJCAA record of 22 threes and would have tied the NCAA Division I and NBA three-point record of 25 in a game. It looked like trouble for the Trojans from the get go, as the Lady Saints started the game on 19-0 run. It took Colby nearly five minutes before they hit their first field goal of the game. Colby kept it under control for the remainder of the quarter, but Seward was still ahead, 27-9 after one. The Lady Saints put the game away in the second quarter, putting together typical full-game numbers in just one quarter. Seward made nine threes in the quarter, while all 14 of their baskets came from assists. Seward also had 11 steals and 6 blocks in the second quarter alone. Seward entered halftime with a 66-13 lead, allowing just four points in the second quarter. The third quarter was better for the Trojans, but not nearly good enough to slow down the red-hot Lady Saints. Seward shot 56 percent in the third quarter (14 of 25) and added on seven more threes to their total. Chelsea Lazenby broke the three-point record with a shot from the win with just over one minute to play in the quarter to put the score at 96-28. The Lady Saints continued to push their lead into the fourth quarter, entering with a 101-30 lead. Seward used a 29-18 fourth quarter scoring advantage to extend their already large lead to ensure the record-breaking victory, winning handily 130-48. Seward shot the ball 103 teams, making 47.6 percent of their shots (49-103). Sixty-two of those shot attempts were three-pointers, making 40.3 percent from deep (26 of 62). The Lady Saints held the Trojans to just 24.6 percent (17 of 69) from the floor and 28 percent (7 of 25) from behind the arc. The Lady Saints held a 66-45 rebound margin and forced 29 turnovers. Of those 29 turnovers, 24 of them came from steals, while Seward had just seven turnovers. Seven Lady Saints finished in double-figures, led by Mollie Mounsey’s 23-point performance. Brennyn Seagler (12 pts), Amy Scott (12 pts), Vanessa Caro (12 pts), Lexi Hernandez (11 pts), Sidney Tinner (11 pts), and Vilma Covane (10 pts) all reached double figures. Seagler and Tinner also came away with double-doubles, both finishing with 10 boards. It marks the second career double-double for Seagler and the first for Tinner. Every Lady Saint scored in the game. The Lady Saints will return to the Greenhouse on Saturday, February 24 to take on the Dodge City Conquistadors at 6:00 p.m. for Sophomore Night. The game will be free for all fans thanks to our sponsor Sharp McQueen. Free tickets can be picked up at Sharp McQueen and both Pizza Hut Locations.